Democrats are desperate to convince voters that the improving Trump economy is not helping America's workers. With their party's prospects threatened by booming job growth and soaring consumer confidence, House Minority Leader Nancy Pelosi (D-Calif.) and other Democrats cite still-stingy wage gains as proof that the GOP tax cuts benefited only the wealthy and big corporations. Unemployment may be down, they say, but adjusted for inflation, consumer purchasing power hasn't improved at all. There has been, in short, no trickle down. The New York Times sounds this theme in a recent editorial that bemoans paltry gains for workers and blames "American companies [that] have made an art form of not sharing wealth with workers." Their message? Don't love this economy, stupid. [post_ads]The editorial board was undoubtedly inspired by David Leonhardt, who joyfully described what he calls a "Trump Slump" in wages in a recent Times column. He noted that wage gains adjusted for inflation show virtually no increase over the past year. He is right; that's what some of the data shows. But, for a variety of reasons, recent statistics on wages do not reflect what is actually happening in the job market. Also, they do not show the impact of President Trump's tax cuts. Bottom line, workers are much better off today than they were, despite the headline pay data. Let's start with the statistics. Wages for private-sector workers rose 2.9 percent for the 12 months ending June 30, according to the Bureau of Labor Statistics. Over the same period, consumer prices increased by 2.9 percent, as determined by the Labor Department's Consumer Price Index. However, the Federal Reserve's preferred measure of inflation, the price index for personal consumption expenditures produced by the Department of Commerce, rose only 2.2 percent over the same period. So, workers either treaded water over the past year or actually saw a modest real wage gain, depending on which statistics you use. Either way, admittedly, they did not see a huge increase in real hourly wages. But those figures have been swayed in recent months by large numbers of people entering the workforce. Over the past year, the number of people working has increased by nearly 2.5 million; many of those are people who previously had trouble finding a job and who therefore had quit the workforce or had stopped trying. Because of the hot jobs market, employment of people likely to be at the low end of the wage spectrum has moved sharply higher. The most recent update from the National Federation of Independent Businesses reported that, "Owners complain at record rates about labor quality issues, with 87 percent of those hiring or trying to hire in June reporting few or no qualified applicants for their open positions." You can bet those less-qualified applicants are not offered as much pay as candidates who met employers' standards. A high number of lower-earning folks entering the workforce would naturally bring average pay down. For instance, unemployment among those 25 and older without a high school degree dropped over the past year from 7 percent to 5.1 percent. The jobless rate for black teens has declined from 23.2 percent to 19.9 percent, while unemployment for the disabled has fallen to 8.5 percent from 9.6 percent. Desperate employers have also turned to hiring ex-felons. One reason demand for low-skilled employees has been robust is that the retail sector, after cutting 6,000 jobs per month last year, has been on a hiring spree, adding 12,000 per month so far this year. Many of those jobs pay the minimum wage, which, again, lowers average wages. That's not all. Another factor influencing average pay is that all the job growth has been in the private sector, not in government - a trend we should all applaud but that also lowers average pay. Over the past year, the number of government workers held steady, while employment in the private sector rose by more than 2 million. The BLS reports that total employer compensation costs for private industry averaged $34.17 per hour in March, the latest available, while for government workers total hourly comp amounted to $49.40. Meanwhile, middle-class workers are better off because they are paying less of their earnings to Uncle Sam, thanks to the Republican tax bill. The Tax Policy Center stated that middle-income households will see taxes go down by $900 this year. Those are real savings that help pay the bills, just like wage hikes. 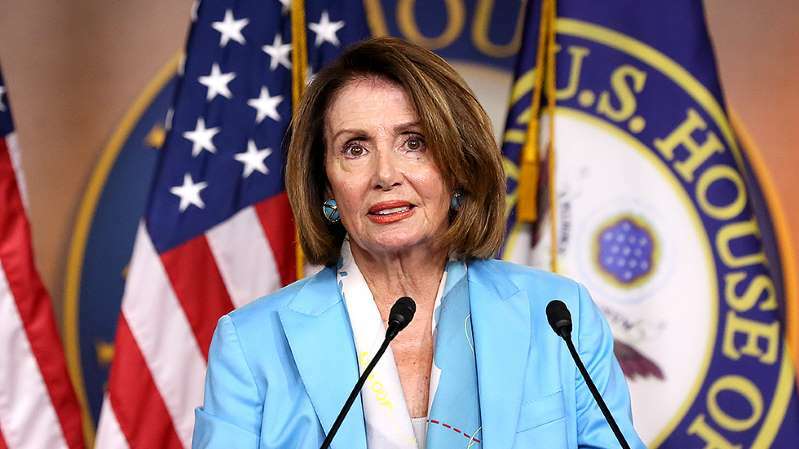 In one of her more mystifying pronouncements, a few weeks ago, Nancy Pelosi dismissed the dropping unemployment rate, saying, "It's about raising - wages rising in our country so that consumer confidence is restored." The former House speaker is behind the times. In December 2016, following the election of President Trump, the Conference Board's Index of Consumer Confidence soared to 113.7, the highest level recorded since August 2001. Last month, that figure stood at 127.4. People are more confident because jobs are plentiful, the economy is growing and because a great many people are seeing their wages go up. Possibly the best data point of all: The number of people leaving their jobs soared to 844,000 in June, up from 760,000 a year earlier. People only quit when they have a better opportunity and, usually, the prospect of higher pay. That's what's happening now, and it's bad news for Democrats.